Cervical vertebrae of six horned dinosaurs from the Upper Cretaceous of Mongolia, which are identified as Protoceratops andrewsi are examined. It is shown that vertebrae of the same serial number essentially differ in different specimens. The differences concern, for example, the shape of the vertebral centra, proportions of the centra and neurapophyses, inclination of pedicles of the neural arch and long axis of the diapophyseal base relative to the longitudinal axis of the centrum. Comparison has shown that available sample contains representatives of at less four morphotypes. Original Russian Text © V.S. 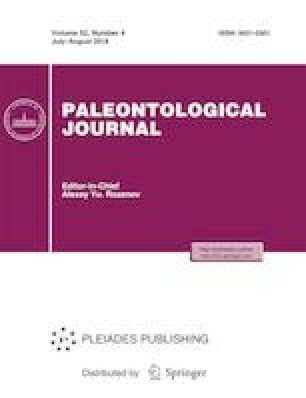 Tereschenko, 2018, published in Paleontologicheskii Zhurnal, 2018, No. 4, pp. 77–91.